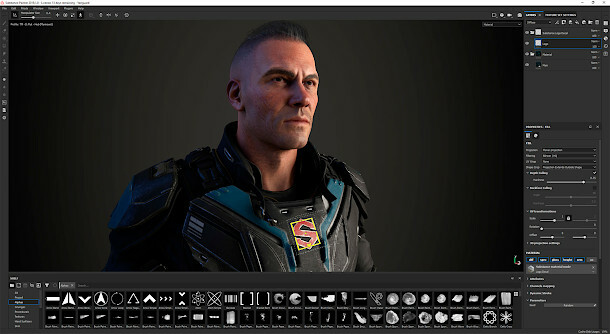 Allegorithmic has announced the new features coming up in the next release of Substance Painter, its 3D texture painting software during its Substance Day event at GDC 2019. The update, which is shown as Substance Painter 2019.1 in Allegorithmic’s screenshots, will feature radial symmetry, new height-blending options for materials and new projection modes. In addition displacement and tessellation are now supported in Substance Painter’s OpenGL viewport and displacement in the integrated Iray renderer. Substance Painter 2019.1 is due to ship in April 2019. The current release, Substance Painter 2018.3, is available for Windows 7+, CentOS 6.6/Ubuntu 16.04 Linux and Mac OS X 10.11+.